It’s surprising, given my love of all Asian food, that I’ve never really cooked Korean food. Luckily, thanks to an awesome birthday gift from my friend Sherri this weekend, that has changed! Sherri gave me a book called “The Korean Kitchen” by Young Jin Song, a book her mom gave her to get her started on Korean cooking. The book is full of beautiful photos, and it even gives you some Korean history and tells you where to buy specific ingredients. After trying to recover from two colds and the flu back to back, and with the temperatures dropping below 20 degrees in NYC, nothing sounded better to me last night than the recipe for spicy kimchi stew. So I’ll tell you both the original recipe, and the changes I made. First of all, the original recipe calls for boneless pork chop, but there is a suggestion in the notes that you can substitute fresh tuna steak. Since I haven’t eaten pork in over a year, I went with the tuna! I actually think it could work well with just the tofu in the recipe, but I leave that up to you… Also, I cheated and didn’t make my own kimchi. There is a recipe for kimchi in the book, but there are two Korean markets in my neighborhood that make their own and sell it, so I went for the easy route (I’ll blame it on the fact that it was a school night). Anyway, here it is: Soak 4 dried shiitake mushrooms in warm water for 30 minutes. When they are soft, drain and slice them, discarding the stems. Dice 5oz of firm/extra firm tofu into cubes. Dice the 7oz of pork (or fish) into bite sized cubes. Slice 11oz of kimchi into small pieces, squeezing out the liquid first. Add 3 tbsp of vegetable oil to a heavy pot, adding your meat/fish and 1 crushed garlic clove, and saute until cooked. Then add the kimchi and 1 tbsp of Korean chili powder (I actually couldn’t find this either, and used Sambal Oelek chili paste, which came out fine!) and cook for 1 more minute. Then add 3 cups vegetable stock and bring it to a boil. Add the tofu, mushrooms, and 2 chopped scallions, cover, and simmer for another 10-15 minutes. Add salt if you want (I found it didn’t need any) and serve hot! We had ours over a little rice, but it’s delicious just on its own too. 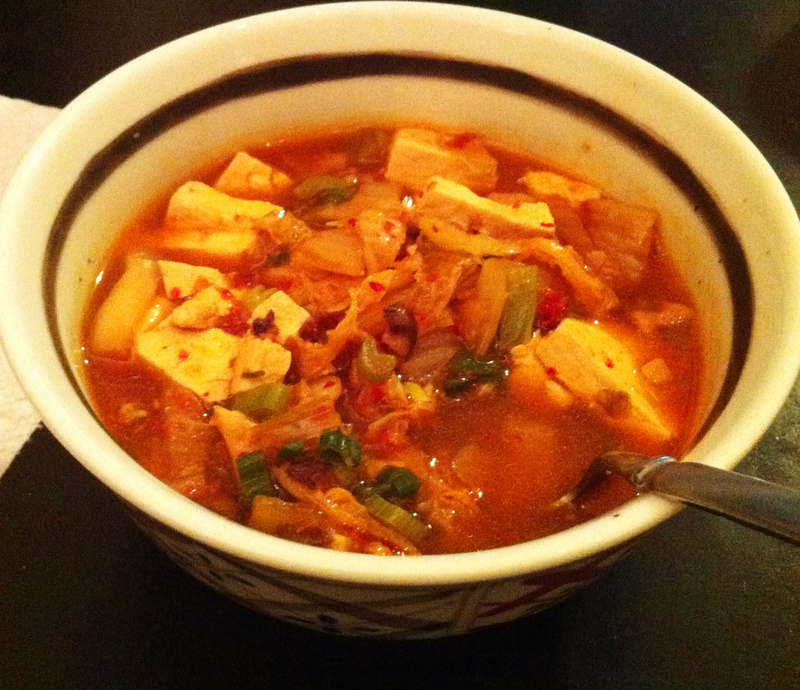 This entry was posted in Cooking adventures and tagged dinner, fish, Korean, soup, spicy, stew. Bookmark the permalink.